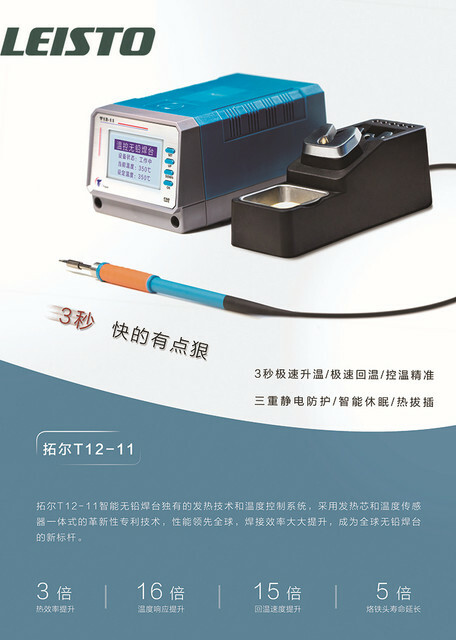 In order to use LEISTO T12-11 More better, you need to know these informations which is very important, it can Extend the life of LEISTO T12-11 soldering station. More efficient repair moible cell phone. Special for mobile phone repairing, if you with a great device, it can greatly improve your maintenance skills and efficiency, it makes earn more money, helping more people who phone's was broken. Let's talk about how to using LEISTO T12-11 Soldering Iron? Work: When the handle leaves the bracket, the buzzer sounds, the LED display will remain lit, and the soldering pen is at working temperature. Sleep: When the handle is placed on the handle bracket, the LED display will be dark after 3 seconds, and the soldering pen temperature will drop to the set sleep temperature. Shutdown: When the handle is placed on the soldering pen holder, the buzzer sounds and the LED display is dark. At this point, the device stops heating the soldering pen. When the handle is placed on the handle bracket, the LED display will be dark and the temperature of the soldering pen will automatically drop to the sleep temperature. This function is quick and the user can see the set temperature drop from the LED screen. Thanks to the sleep mode, the oxide layer on the top of the soldering pen is greatly reduced, so the soldering pen life is extended by 3-5 times longer than in the same applicable condition, in order to make full use of the sleep mode, and at the same time as an energy saving scheme, when the product is not applicable It must be placed on the bracket, and the life of the soldering pen is directly related to temperature and working time. When the temperature is high for a long time, the life of the soldering pen will gradually decrease. Because of this, it is wise to place the handle on the stand to put the device into sleep mode (approximately 150 ° C) in order to increase the life of the solder pen. In order to achieve better thermal conductivity, the tip of the soldering pen is also wrapped by the tin layer to prevent oxidation and increase product life. When the handle is not connected or the handle is not connected, the “Working Temperature” will display “Outage”. When the handle is placed on the handle bracket, the device is in the sleep state, and the set sleep temperature is displayed at the “working temperature”. When the handle is placed on the soldering pen holder, the device stops heating and gradually falls back to room temperature. When the handle leaves the bracket, the welding pen is at the working temperature, and the current set temperature is displayed at the “working temperature”. Please wipe the flux on the handle bracket in time.